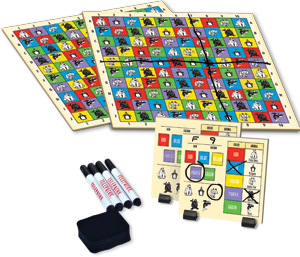 Telepathy Junior Board Game for Kids! 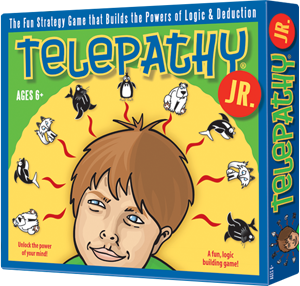 Telepathy Jr. is the kid’s version of the original Telepathy game which debuted in December 2008. Telepathy Jr. will teach kids how to use logic and deduction. In this puzzle solving game of logic and deduction, players match wits to see who can be the first to locate their opponent’s secret square. Through the process of elimination, every turn brings you closer to finding its discovery. But watch out: your opponent may be closer to finding your secret square than you think! Plays in 10-20 minutes. For 2 players six and older.